It’s the 4th day of Christmas. Where are my calling birds? Last week I noticed a front-page story on the “Express” newspaper about holiday gift giving may be postponed until after December 25th due to the economy and the anticipation of deep price cuts for consumer items. Fortunately, this all fits in perfectly if you’re expanding and bringing “diversity” into your holiday. Today is the 8th and final day of Hanukkah. Hanukkah celebrates the triumph and miracle of the light over darkness. The Hanukkah story is a war story from over 21 centuries ago. The unarmed Maccabees defeated the great Syrian Greek army who ruled much of what is called the “holy land.” These former rulers defiled the Jewish temple. After the battle was won (considered a miracle), the temple was rededicated but there was not enough oil to light the holy temple. The little oil there was available astonished everyone when it burned for 8 nights. No gifts are required, but if one must “tis the season,” it’s usually a token. After January 6, it’s time to gear up for Mardi Gras. The King Cake has a plastic toy baby baked inside. Whoever gets the slice with the toy infant buys next year’s King cake. Fat Tuesday is February 21. I’ve done the New Orleans Mardi Gras. I put the crowds into two categories: for tourists, it’s a wild party. For locals, it’s a time to get together with family watch the parades, cook up some food, and have folks over. To be honest, I didn’t fee safe around the tourists. And I’m from DC. But I was there with a friend bearing gifts of pound cake as you’ll see in the video from the Church Lady Cake Diaries. Happy Holidays! A lot of stuff is about to close down come 2012 — here in DC. There are a few things I’d like to see; one, I’ve already been there and done. This one’s a maybe. It got a lot of good local press and buzz in anticipation of the exhibit’s opening in late September. The Newseum is across from the National Gallery; but it has a $21.95 admission fee. The National Gallery of Art is free. Perhaps my interest is seeing how Warhol plays in the west wing of the gallery which is nearly always reserved for works pre-20th century. The exhibit is a first all around in terms of Warhol’s work with a newspaper front-page format. Perhaps a visit is a matter of seeing what the fuss is all about. I’ve got a little time on this one, but I may see it earlier than later because word on the street is that the fuss is legit. This exhibit takes a bold step in framing the exhibit in what the curator and the collectors (who have loaned the art for this exhibit) deem as important contemporary African American artists of the last 3 decades. The art is part of the private collection of Don and Mera Rubell who live in Miami, FL who have plans for DC‘s art scene. DC has always been a city that appreciated the greener grass from another yard. 30 Americans from Corcoran Gallery of Art on Vimeo. 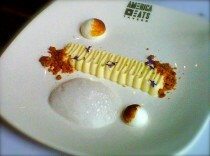 You can say Jose Andres ThinkFoodGroup has done it again, or done something else. (photo right: America Eats version of Key Lime Pie – deconstructed) When the National Archives opened its exhibit “What’s Cooking Uncle Sam,” an exploration of the government’s historic role in the production, regulation, research, innovation, and economics of our food supply, Jose Andres was front and center to pair the NARA exhibit with an experiential dining exhibit in the old Cafe Atlantico restaurant. This is not only an experiment in museum exhibition but also restaurant exhibitionism. America Eats Tavern is a sponsored restaurant (Dole Pineapple, America Express). It’s essentially in a pop-out space (temporary) owned by ThinkFoodGroup. According to our server, the America Eats restaurant will move to a new location in 2012, Cafe Atlantico will re-open in a new location, and the 8th Street location will be a test kitchen for the ThinkFoodGroup. [All servers are well schooled in the menu and the restaurant. This is not the gig until a part in the movie comes up.] Food is now big business for Jose and yet it looks like he’s still having fun. The America Eats Tavern is definitely a foodie experience with its contextualized menu describing the historical origins of every dish and drink based on Jose’s extensive collection of American cookbooks. Limes arrived in the Florida Keys in the 1830s, thanks to a US Consul from Yucatan, Mexico. Two decades later, sweetened condensed milk was invented and the new invention rapidly took hold in the South, where fresh milk spoiled quickly. By the end of the century, the two ingredients were combined to create the famous unbaked pie, not long before a hurricane wiped out the original key limes in the 1920s. Let’s also remember that American food and flavor has evolved over the years with each encounter. I would say for the better. BTW, Jose’s from Spain. I suppose he’s become our new Tio of what America eats. As for “What’s Cooking Uncle Sam,” the book is more interesting for me than the exhibit. It’s a start in using original documents from the archives file to appeal to audiences that have fully embraced the foodie craze. But for me the exhibit has lots gaps including stories of the beginnings of the school lunch program. This could’ve been enhanced with testimonials from persons who ate the wheat bread with apple butter (this wasn’t mentioned in the exhibit, but it was served in schools in DC). The Olio Margarine busts are interesting (yes, margarine was treated like “crack cocaine” thanks to the Margarine Laws demanded by dairy farmers); and the testimonials that gave rise to food regulation that saved lives might make a Tea Partier think twice shutting down the government. But how has the government effected our eating habits? This is the question “What’s Cooking Uncle Sam” is exploring. However, overall the exhibit is uneven and really goes off topic ending with recipes from the White House. Many of us never knew what U.S. presidents ate. Was it determined by the USDA? BTW “What Cooking…” is free; America Eats Tavern can cost up to $60 for a 3 course experience with drink — and until July, a portion of the sales will benefit the National Archives — but the experience was worth it. Gemal Woods at Park Triangle is turning out a new on-line series that looks fresh. It’s called “The Angle,” an “Eclectic Docuseries.” Hmmm I like his style. I’m impressed by the talent Gemal’s brought into the studio or found round about us. Gemal is making me forget that DC is a “government town.” Check it out! Episode #5: The Actor (feat. Clayton LeBouef) from Park Triangle Productions on Vimeo. Zoo Lights at the National Zoo. It’s Free. It’s beautiful. It’s magical. And yes, people made “Tron 2” jokes about it, but who cares. 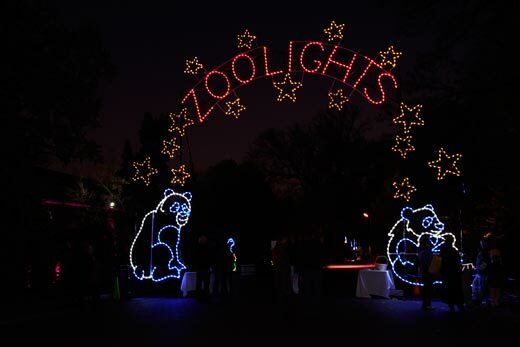 Zoo Lights juice provided by Pepco. And of course, I’m still just scratching the surface. 2011 turned out to be a year of renovation and dramatic change in so many areas. This year, I contracted my first home renovation — for my bathroom. This was not an eye candy renovation; it was a necessary one. Once the project was underway, my car decided to play dead at the same time. My lap top didn’t want to turn on. And internet access became sketchy until the lap top was repaired and Cricket mobile broadband entered the picture. Even this blog became a casualty of “my situation” (code for the renovation project) in addition to other things that began to reflect years of neglect. Multi-tasking was not an option. I was out of my element/my space for a month with my things in different places and work to do to pay the bills for everything and more. I could only focus on what was in the moment right there before me. 1. If you live in an apartment or home with only one bath or one kitchen, be prepared to live out of your apartment for at least 1 month. This mostly applies to any work requiring plumbing, major wiring, knocking out walls and major construction. Paint jobs are a breeze. Some carpentry like cabinets or shelves might not throw you out of your digs. But regardless of what your contractor tells you (like 7 – 10 days), I’d estimate 4 – 6 weeks per room. 2 – 4 months if an architect is involved. 2. Whatever budget you have, add 30 – 50% more (including item 5). People will say “yes” to your budget and “yes” to additional items for the project. I was advised years ago to purchase my own materials to avoid upticks. However, you know how time consuming shopping for materials is, especially if this is not your profession or even hobby. Basically you’re paying someone to do that for you and to use their discounts as much as possible; just be prepared to pay. 3. Pre-approve purchases all purchases. Some little items are necessary, some big items not so much. Know the difference. You need to know where your money is going and why. 4. Bring contractors down to earth re budget and time. See items 1 and 2. Once the room is gutted, there’s no turning back, so might as well keep it real from the top. 5. Budget for some pampering like a massage or even counseling. Major changes in your space are just that — major. They do affect your psyche. You may feel like your world’s turned upside down. You may find some other problems lurking in those walls or other places that needed attention years ago. It may feel like the world’s crumbling all around you. But always remember, there is a light at the end of the tunnel. 6. I would suggest some kind of warranty in the contract. Stuff might not work 2 – 3 weeks later. It’s been a month for me, and so far so good. But it doesn’t hurt to be covered for the “what if.” If car mechanics offer it, why not everyone else. 7. Cover all your stuff with plastic or drop cloth. Regardless of what you’re told (remove items from surfaces), best to put everything under wraps or pack it away. The dust that gets kicked up is amazing. Unless you have Felix Unger doing the work, you’ll have to a clean up after. There will be lots of trips to the laundry and maybe the need for a professional cleaning crew. 8. Ask your contractor to bring their own damn paper towels and cloth wipes. Even when I tried to hide my dust cloths, they somehow found them and used them for their work. The paper towels were gone. I didn’t replace them. Perhaps contractors should ask for these items up front as part of prep. 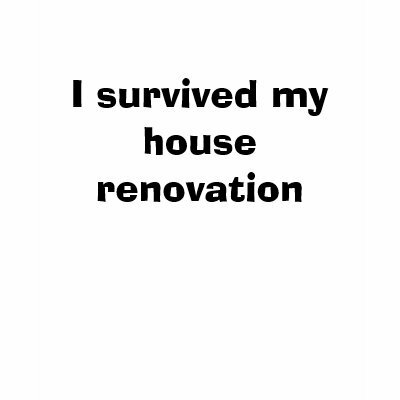 Personally, I don’t know anyone who didn’t go through some kind of upheaval during a home renovation or major repair. It’s the way of that world I’ve learned. Self care is key. As I grow into my new world ordered, I see the need to make additional changes on so many levels….including this blog.